phone 07 4974 7557 for more times and dates. More 1770 larc tours will be added as demand increases. Group tours can be arranged for other days/times. Fees are payable at check-in. Please Note: Children under the age of 8 are not permitted to access the lighthouse. Departs daily on demand. As the sun approaches the horizon signalling the end of another beautiful day, experience the peaceful solitude & changing moods of our tropical paradise. This one hour cruise takes in the magic of Round Hill Creek and Eurimbula National Park with its wildlife and magnificent views of Round Hill Head and the coastline. It is the perfect way to experience the delights of 1770 and the thrill of our unique amphibious vessels. Departs Sundays: 11:00am – 1:00pm. 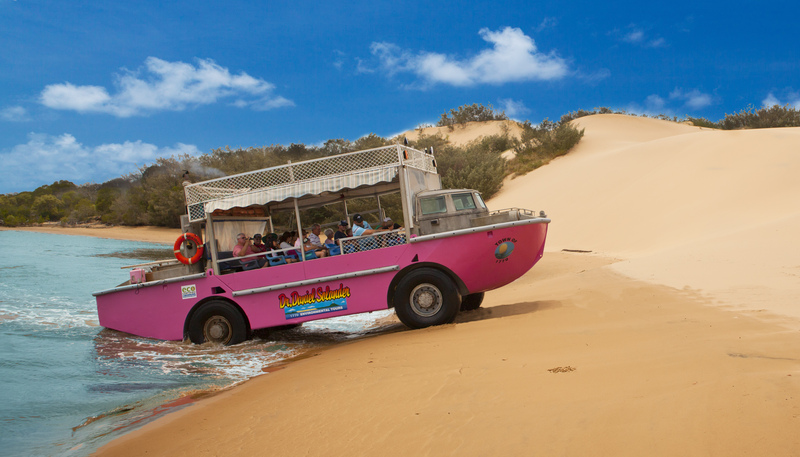 Ride on the iconic pink LARC vessels in the Town of 1770 and have a picnic lunch on the sand. The 2 hour LARC! + Lunch Tour travels along the coastline of Eurimbula National Park and pauses for a picnic lunch amidst the magnificent views of Round Hill Head and Bustard Bay. The unique amphibious LARC vessels are an ideal craft to enjoy cool breezes and amazing views whilst the surrounding environment becomes incredibly accessible! Your experienced skipper will relay details on the history of the area and you will tour the coastline of the Town of 1770, the Birthplace of Queensland. Sandbar fun, wildlife and bird-life viewing with lunch and refreshments offshore, what a great way to enjoy this tropical paradise! Departs Tuesdays and Fridays: 9:30am – 11:30am. Enjoy a theatrical experience and learn about the wonderful culture that lived here sustainably for tens of thousands of years. Get an authentic Indigenous hunting, gathering and tasting experience of a lifetime! Go back to a time that pre-dates the arrival of Captain James Cook in the Town of 1770. Travel on the Larc across the beautiful Round Hill Creek, to the coastline of Eurimbula National Park, where you will disembark and take a bush-walking tour with the skipper and an Indigenous guide. If tours are cancelled by 1770 Environmental Tours due to rough weather policy, tour is fully refundable. Cancellation by you within 72 hours of departure or no show on day of tour 100% non refundable. Cancellations by you outside of 72 hours of departure incur a 25% cancellation fee. We can also help you book your travel Australia-wide! If you need an east-coast package put together, or would like to book your Uluru or Reef adventures, please just ask our friendly staff and we’ll do everything we can to help you out.